Dr. Gharekhan received her medical degree from Lady Hardinge Medical College University of Delhi. She completed an internal medicine residency at North Shore University Hospital and went on to do a fellowship in hematology/oncology at the same institution. She is board certified in internal medicine. 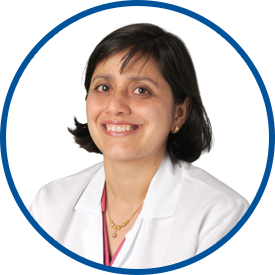 She is affiliated with White Plains Hospital and Greenwich Hospital, and is a member of the American College of Physicians and the American Medical Association. Dr. Gharekhan’s interests include preventive medicine and treatment of hypertension, diabetes, high cholesterol and osteoporosis. She is bilingual and is fluent in Hindi. She practiced in the Westchester/Fairfield County communities for eight years prior to joining WESTMED Medical Group in August 2006. Degree: Bchlr of Med., Bchlr of Surg. *Dr. Gharekhan is an excellent doctor. My experiences with Dr. Garekhan have always bee excellent. She is as good as they come.